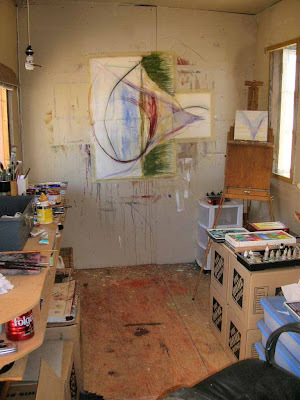 My art studio and the beginning of Painting #3 - "Stasis"
This week we're taking risks as part of the "Risk" Chapter in our Joy Diet Creative Blogger's Book Club and I have started painting again after a long hiatus of about one year. My "Desire" (Chapter 3) which had not yet been identified (actually, it was deliberately kept private) is being revealed brushstroke by brushstroke as I explore emotions and intimacy within my marriage. Each day that I paint I feel these emotions deeply as I express them on paper with paint, ink, water and pastel. I risk exposing myself and my inner world to the world-at-large feeling raw, vulnerable and accountable as I begin "Journey into Intimacy" a new series of large paintings (4' x 5') - partly abstract, partly symbolic and very expressive. You can read more of my Joy Diet posts here. You can still sign up for the Joy Diet Book Club here. Painting #1 - "Finding My Wings" and Painting #2 - "Arrow of Pain"